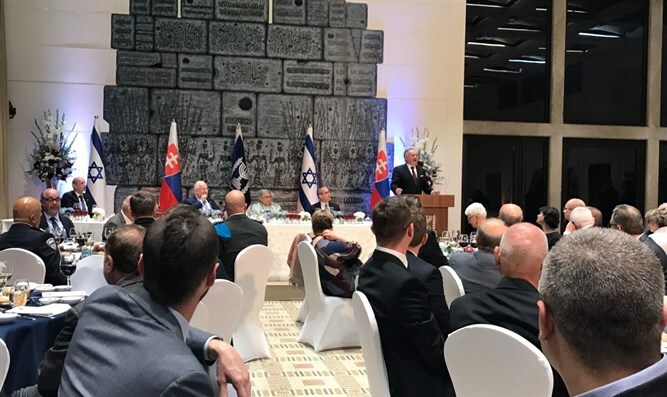 Israeli President Reuven Rivlin and his wife, Nechama, held a state dinner Wednesday night for the President of the Slovak Republic, Andrei Kiske. President Kiske said, "When I was 27, I moved to the US. My wife stayed behind with the children, and when I did not find work as an engineer I found work at a gas station [instead]. My boss was a Ukrainian Jew I saw how the Jewish community was united. And when I returned home to Slovakia, I also asked myself: why not become a Jew?" "I truly admired this community and it had a great impact on my life. When I visit here I see this community, and the greatest inspiration I get here is from the way you talk about your problem - by working with passion to find a solution for those problems. You work hard and you know you can do it," he added. Kiske continued: "The big challenge is how to make these dreams a reality. What can we do when we see that the world is becoming more radical, more dangerous? And the answer is that we have to stand together behind our values." At the end of his speech, the President of Slovakia invited President Rivlin to visit his country to "discuss our values together, for the sake of the young people in both countries." In his remarks welcoming his Slovakian counterpart, Rivlin said: "Israel had to overcome the relative lack of natural resources, overcome its limited size, and many geopolitical challenges, with an impressive intellectual tradition and extraordinary human capital. Investing in innovation was the most logical solution, [and we became] a leading player in high-tech, irrigation, agricultural technologies, etc. We do not believe in isolation and in a zero-sum game, and we strive to share our knowledge and achievements with our friends. We believe in global cooperation.